Gifted bartenders, tasty drinks, great music and obviously, just the right amount of competitive spirit, just to name a few things that characterized this year’s Jameson Bartenders Ball, the place where young bartenders with their Jameson inspired cocktails competed for the advancement to the global finale in Ireland. Competition was tough yet again and the afterparty awesome. Business as usual you may say. 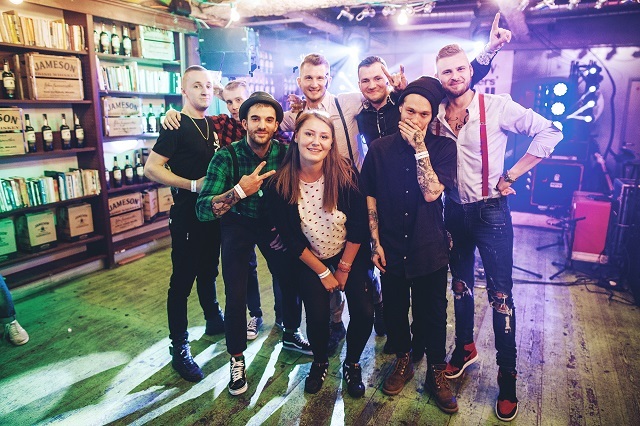 A band of young bartenders gathered on 20th September in KC Dunaj, in Bratislava in an effort to put their bartending skills to the test and bond a little more. And that’s the very essence of the Jameson Bartenders Ball which needs no introduction in the bartender community. This year, just like in the previous ones, 8 bartenders from all over Slovakia had their work cut out for them and that constituted mixing the most authentic drink. This time though, one of the ingredients was supposed to be the all new Jameson Caskmates, an original whiskey being aged in barrels that previously housed beer. The jury that was made of Oisin Davis (a bartender of a global caliber and a global consultant for Jameson Irish whiskey), Barbora Tapušíková (the winner of the Jameson Mixmaster Challenge 2017 global finale) and Viktor Miško (Brand Ambassador of Jameson in Slovakia) picked the winning drink that carries the name Lucky Daydream dreamed up and mixed by Alexander Vukomanič from the Spin cocktail bar in Bratislava. The winner is awarded an exceptional trip to the global finale of the Jameson Bartenders Ball in Ireland. Announcing the winners did not obviously conclude the evening. All contestants and jurors had a blast until the wee hours of the morning in the company of quality drinks and great music brought to them by the bands Billy Barman and Malalata. The atmosphere was truly breathtaking! ,,We’ve got another quality Jameson Bartenders Ball under our belt now that allowed us to meet some aspiring bartender talents, but not merely that. We had the chance to bond with new people and have some unforgettable experience. I am glad for the Jameson Bartenders Ball to create a par for the course community which keeps together during as well as after the competition. I am absolutely positive that this year is not just an exception,” Viktor Miško, the Jameson Brand Ambassador couldn’t hide his happiness.